Business meetings: they’re sort of like the office equivalent of a root canal. But meetings don’t have to be painful, drawn-out procedures. Whether you need to schedule a meeting, draft an agenda, or simply remember who was there, we have an app for you. Meeting Pad helps you keep track of all meeting attendees and lets you track their action items. I have something to confess: I am terrible with names. That’s why I sometimes leave meetings not sure of who said what and who promised to complete which task. And it’s why I like Meeting Pad. This $5 iOS and Mac app lets you enter the names of meeting attendees (or import them from your calendar or Apple contacts) and add notes about their contributions. Meeting Pad also lets you create a meeting agenda and record audio, and it automatically creates minutes for you, which can be emailed directly to all attendees. Its layout is attractive and using the app is a whole lot less painful than sitting through some business meetings I’ve been forced to attend. Talking Points displays your talking points in a large, easy-to-read font. When you’re giving a presentation, there’s a very fine line between sounding completely unprepared—when you hem and haw and can’t remember everything you wanted to say—and sounding like a robot, reading stiffly from a prepared speech. Landing somewhere in the middle is hard, but TalkingPoints, a free iOS app, can help. It lets you create a list of talking points for your speech, and displays them in a font that’s big enough to see from a distance—so you can leave your phone sitting on the table in front of you, rather than clutching it in your hand. I like how easy it is to rearrange items by dragging and dropping them, too. Often the hardest part of any meeting is finding a time to schedule it. That’s why I love Doodle, the online scheduling service that’s available in a $3 Android and iOS app. Like the web-based version, Doodle’s mobile apps let you create a poll to see when the majority of your meeting attendees are available. Your address book and calendars are integrated with the app, making it easy to send out the poll right from your phone. And you can participate in polls, comment, and view results on the mobile app, too. Doodle's web version lets you choose between a tablet and calendar view when responding to a poll. Trying to schedule a meeting across different time zones? 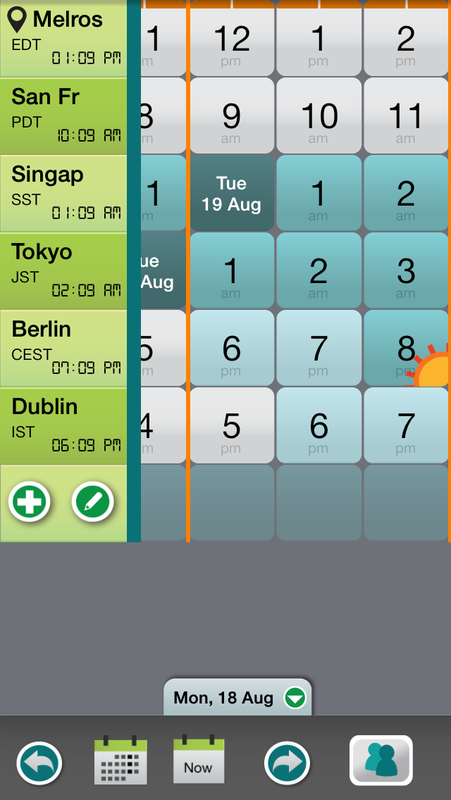 TimePal lets you compare the time in various cities at a glance. Scheduling a meeting is difficult, but scheduling a meeting with attendees who live in various time zones can be darn near impossible. Unless you have TimePal, that is. This iOS app helps you plan meetings across those time zones by handling the calculations for you. It shows you multiple cities at once, and lets you know what time it will be in each of them—and whether those times are during typical business hours or not. From there, you can create an event from within the app and email it out to invited attendees. The free version of TimePal limits you to only two cities, which hampers its usefulness if you are dealing with multiple attendees, but the $3 Pro version lets you add an unlimited number of locations. 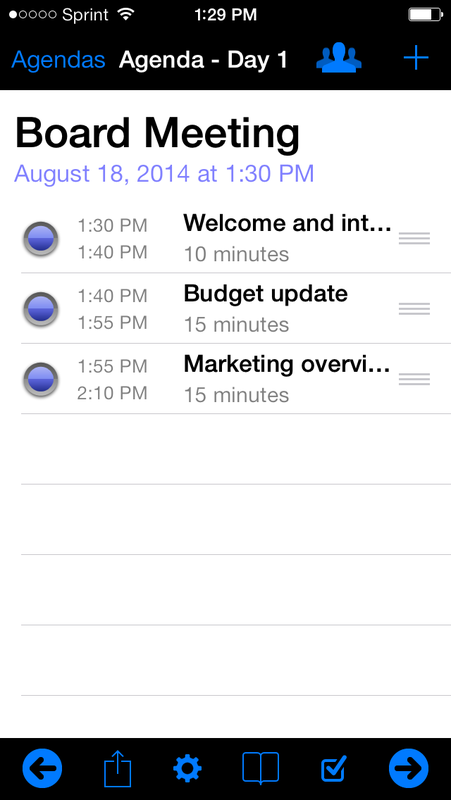 Agenda Maker lets yoy set a time for each agenda item, and automatically calculates the length of your meeting. 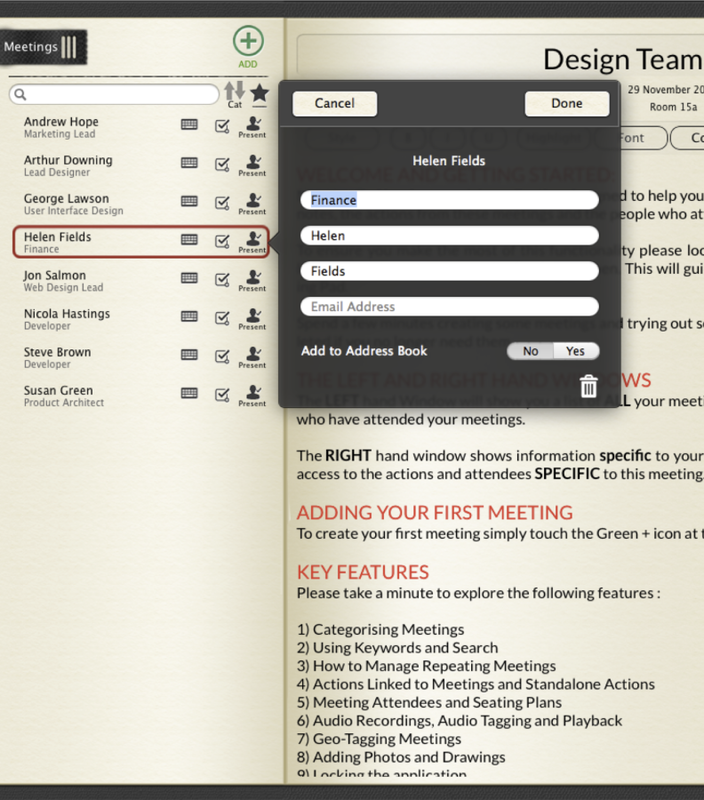 The name of this app is pretty self-explanatory: Agenda Maker helps you create meeting agendas. This $2 iOS app makes drafting an agenda easy, by adding agenda items, sorting and deleting them, and allocating time for each item. The app handles all of the calculations for you, and updates as you delete and add items to the list. It also allows you to share the agenda via email, either as a PDF or using HTML. Sure, it’s not super-exciting stuff, but it definitely is useful.